While the size of the compact ProForm 4.0 X elliptical is a plus, the cheap components should be your first concern if you have any notion of buying this machine. The blue backlit display shows speed, time, distance, calories burned, fat calories burned and pulse. The ProForm 4.0 X elliptical comes with 8 personal trainer workouts, plus Quick Target Toning™ programs to work on specific parts of the body. A Target Pacer™ indicator light to alert you when you need to pick up the pace or slow down to stay in your training zone. Despite offering a few advanced goodies such as the Target Pacer and Quick Target Toning workouts, as well as SMR™ Silent Magnetic Resistance, experts will warn you that the ProForm 4.0 X elliptical has mechanical issues and design problems. The 250-lb user weight capacity is excessive for this 144-lb machine and it will likely feel wobbly and unstable to users weighing around 160 lbs or more. The worst feature is the manually adjustable ramp. Once the ramp is in position, the program automatically changes the resistance level during the workout – or it would if it worked correctly. UPDATE: The 4.0X has been discontinued and replaced with the new SmartStrider Series. You can check it out as well as the other new models reviewed here. Elliptical reviews on the ProForm 4.0 X don’t mince words: it’s awful. The resistance flaws make the machine hard to pedal. Other reported problems: it is difficult to assemble out of the box, noisy, unreliable, the short stride is not comfortable for average to tall users, the warranty is weak, and it is made with cheap components. Selling for $799 MSRP, the Proform 4.0 X is no bargain. It is the worst of Proform’s budget models. The company is owned by Icon Fitness, which also makes NordicTrack and other brands, and many of the Proform models are rebranded machines from half a dozen companies but with the Proform name stuck on it. That partly explains the inconsistency of Proform ellipticals both lines of front drive and rear drive models. You can find affordable Proforms that are surprisingly sound: the Proform 890e elliptical ($649) is so good it is hard to believe it is produced by the same company that puts out the Proform 4.0 X elliptical. 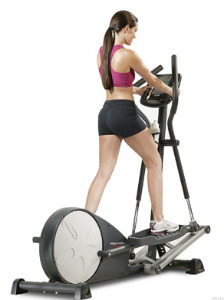 ProForm ellipticals are on sale right now!